One night a couple of weeks ago I was helping Myron install pine boards on the ceiling of his shed, mostly just because I felt like hanging out and that's where to find him. CBC was on the radio, as usual, and he was telling me about this amazing show he had heard on Tapestry. The subject was a guy who went on a sort of spiritual pilgrimage with his violin, walking 1000 kms on the 1000-year-old Camino de Santiago Trail through France and Spain. Along the way, he played (and recorded his improvisations and songs) in at least 25 churches and cathedrals, many of them hundreds of years old. The resulting album is an incredible piece of art. "I realized that I see my life as something that has given to me to use, a stewardship, not an ownership. And that makes a big difference. If it was an ownership, and I really HAD my life they way I can HAVE a car or a violin or a microphone, then I could see being royally ticked of at having this thing taken away. But as a stewardship, I am allowed to live and enjoy my life, to use it to the fullness of my power, knowing all along that I will have to give it back, or let it go, or whatever turn of phrase fits best." 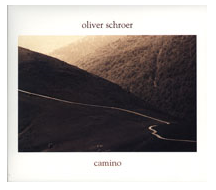 Update: Oliver Shroer's friend and Camino companion Peter Coffman left a wonderful comment yesterday, and his photography is the perfect complement to the music and stories. 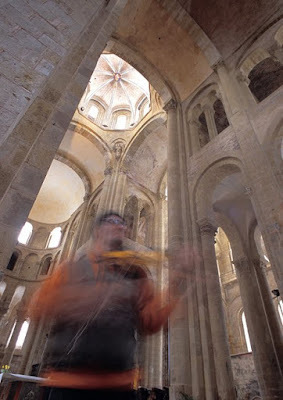 Here are his amazing galleries of his friend and the Camino experience. He was an amazing guy, and a national treasure. Like Stan Rogers, he used his life to hold a mirror to us in a particularly Canadian way. And in a particularly human way, too. Death is mostly hidden from/by us. Did you know him, or at least know of him while he was alive? After finding out that he had lived much of his musical life in BC (Smithers! ), I so wished that I had encountered his music years ago and gone to see him play somewhere. Love the blending of traditional tunes with classical influences and a certain something that could only be his alone. Some of my emotional response was plain sadness that his musical voice had been silenced. Greetings! I stumbled across your blog, and I hope you don't mind my dropping in. I knew Oliver extremely well - in fact, we walked the Camino together. I just wanted to thank you for your comments, and tell you how much it means to all of us who loved him to hear how his work continues to move people. If you're curious, there are several photos of Oli, and of our Camino, on my website (www.petercoffman.com). Peter, thanks so much for your note, and for sharing your incredible photos of Oliver and Camino -- viewed with the Camino songs playing through headphones, it's magical. The music brings the images alive, and the pictures add even more life to the music. He must have been a fantastic friend. So sorry he couldn't have stayed a while longer. I love how the people he touched are keeping his music and memory alive, mostly by learning and playing his songs. I hope to do the same.